What is an eco or green home? So you may well ask what is an eco home or green home? A green home may take on many forms. In short, you want is a home designed, so it makes the most of your climate. 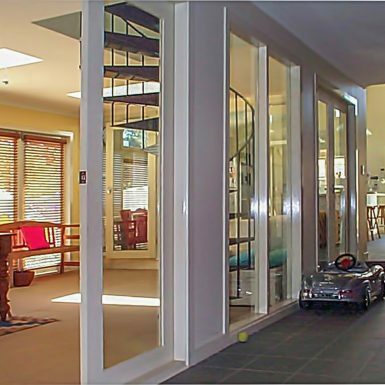 Yes, you want your home designed to make the most of passive solar heating from the sun in winter. Equally important is natural passive cooling in summer. Namely passive solar cooling. Is there such a thing? The answer is yes. You can design a home, so that heat from the summer sun doesn’t overheat your home. Now wouldn’t that be nice? It is all possible, and the best news is that Passive Solar House Design works. It doesn’t involve high-tech gadgets. Specifically, a green home uses low tech passive solar building design that doesn’t cost the earth. What is the Passive Solar House Design? So onto the next question. What is a passive solar house design? Or a passive solar building design? To summarize it means designing your home so that it responds to the change in the weather. For example, you can keep your home cooler, and it stays warm when you want it. Passive solar building design involves the choice of building materials — the type of windows. Where you put the windows in your home, furthermore, it is how you use those building materials. A passive solar designed home makes the most of the winter sun to warm your home. Likewise, in summer you shade your house from the summer sun. Also, you have the means to exhaust hot air from your home. 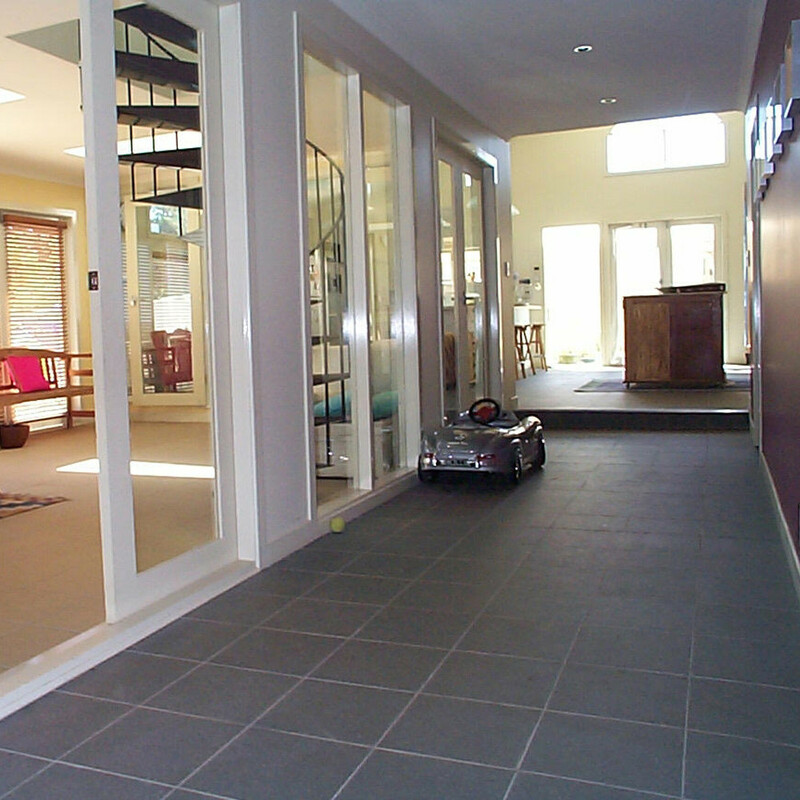 Thermal mass, like a concrete house slab, helps stabilize your indoor air temperatures. What I mean by this is that your indoor air temperatures stay comfortable. Rather than your home heating up in summer when the temperature rises. Or is freezing in winter. The indoor air temperatures remain around 20 to 25 Celsius. All year round. How do I know this? Well, the indoor air temperatures measured in some of the houses I’ve designed have recorded temperatures in this comfort zone. And the indoor air temperature measurements stay in these comfort zones for most of the time. What materials do you use in a green home? An eco or green home can use many different building materials. It doesn’t have to look like it is from the turn of the last century. Made from mud bricks with a thatched roof and organic hemp bag lined walls. A green home is a home designed for the efficient use of resources. You could use salvaged or recycled materials. Recycled silky oak timber benchtops are a feature in the Accessible Home in Essendon. 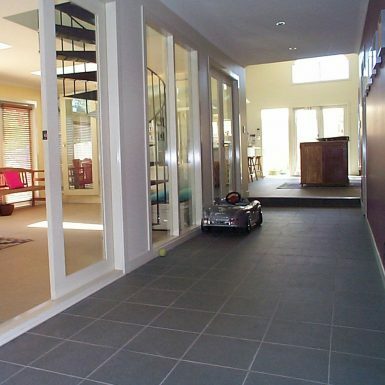 In the same way, the use of recycled materials in the Frankston South Home made it affordable. The use of different building materials helps control over heating and store heat in a green home. 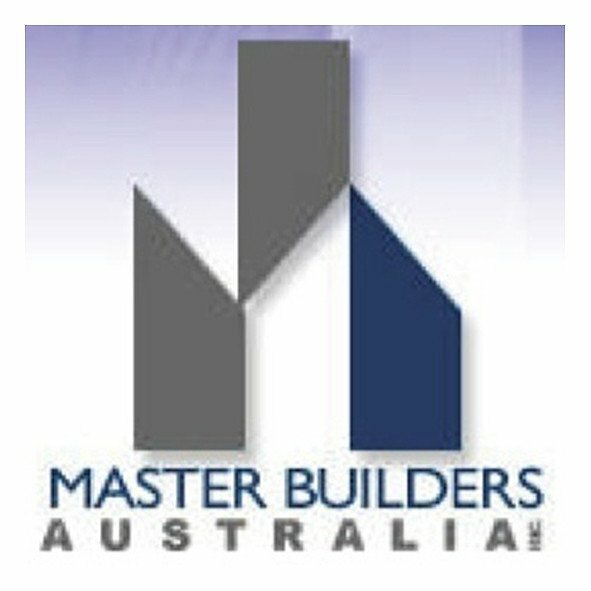 Building materials may have thermal mass or maybe a lightweight building material. 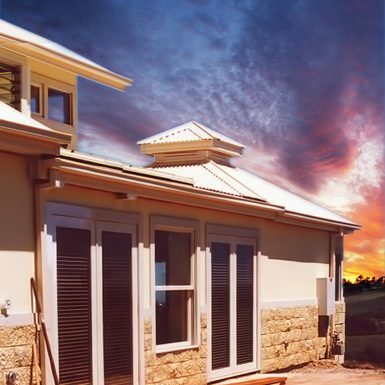 Depending on the type of building material you may choose to use it to help store heat from the sun in winter. Or to allow for the quick cooling down of your home in summer. 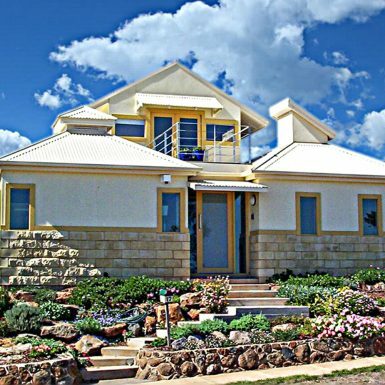 The Sunbury green home is a sustainable home designed for a family of five. After the family moved into their eco-home, they found they used far less household energy than they usually did. Their household energy consumption reduced by two-thirds. With the benefits of a comfortable home and saving money in the long run with much lower energy bills. The top of Sunbury Hill is a windy and exposed location. The Sunbury green home is on top of this hill. Features such as the airlock entry at the front of the house made a difference. 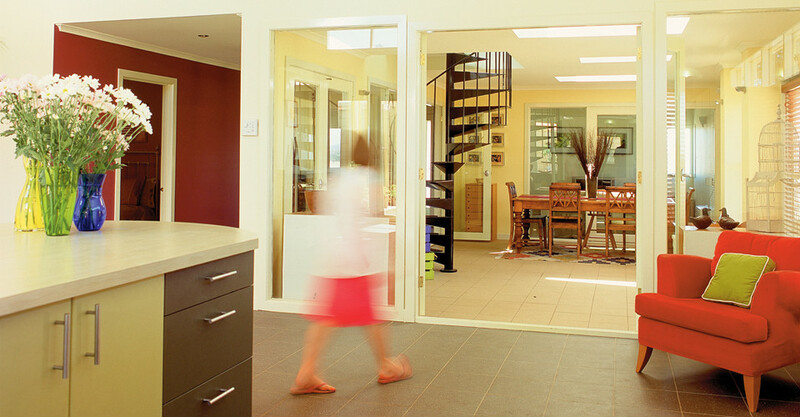 The airlock entry reduces the amount of dust and wind that comes into the home. It also stops the outside hot air in summer and cold air in winter from entering the house. The airlock entry provided excellent protection from strong winds. The modular design of the green home is another sustainable house feature. Using a modular design reduced waste during construction. The size of the cladding panel formed the basis for working out the size of the house. Using the cladding panel size as a module reduced the need to cut the wall panel sheets with the use of more whole panels used to construct the green home. Passive Solar house principles form the basis for the Concept Plan of the eco-green home. These principles include passive solar house heating and solar cooling. And zoning of the utility rooms and bedrooms to the cooler south side of the house. And locating living areas on the warmer north side of the home. Placing windows to catch cross breezes. With High windows to allow for secure night time exhausting of hot air from the house. Low-tech and commonsense passive solar design are easy to understand. Most importantly, they work. 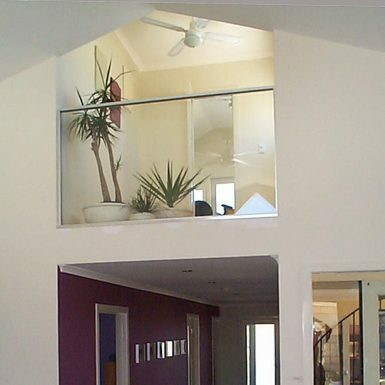 It makes for a logical approach to designing a home to suit the climate. On the whole, you optimize the benefits that come from passive solar heating and cooling. Such as low energy bills. Or more comfortable indoor air temperatures. Features of the eco-green home include a covered solar court and a garden courtyard. The sun court had openable sky windows which allowed the secure exhausting of hot air. The garden court is on the northeast side of the green home. The plants in the garden court help cool hot summer breezes. Plants transpire which provides moisture and water to the air. Plant transpiration means that the garden court provides natural air conditioning. They are cooling hot summer breezes before they enter the home. Cross ventilation and nighttime exhausting of hot air help keep the home cool in summer. Warm air rises. Accordingly, if you have windows positioned high on the wall and raked ceilings hot air is quickly exhausted. The solar pergola, eaves and sun shading devices shade the north facing windows. The shade keeps the sun court from excessive overheating during summer. Passive solar heating during the winter months keeps these areas of the home warm. With the winter sun streaming through the north facing windows. The tiled concrete slab provides thermal mass for absorbing the sun’s heat. Air transfer ducts move warmed air from the north side of the house to the cooler south facing bedrooms with the roof eaves and solar pergola stopping the summer sun from overheating the house. Long distance vistas and views through the home give a heightened sense of space. Combined with high ceilings in the living areas the house has a sense of spaciousness. 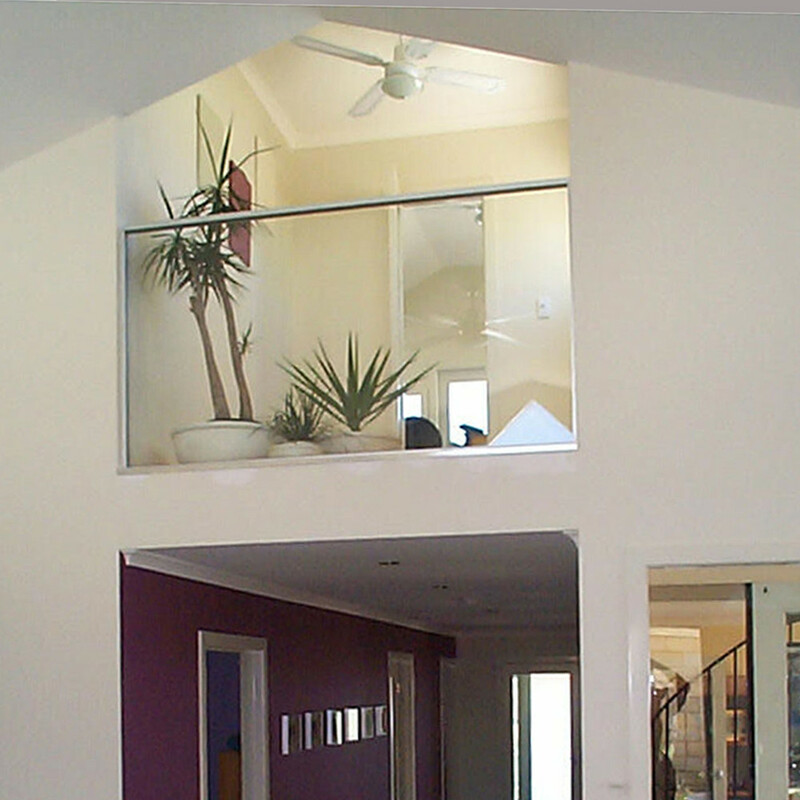 The Client said that the home “seemed so spacious despite the small floor area”. The green home located at the top of Sunbury Hill is on a windy, exposed site. It was the first house built in this greenfield development. 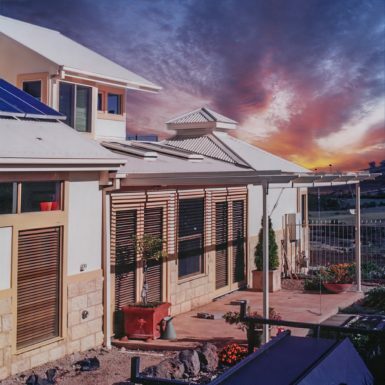 A solar designed housing estate. The climate in Sunbury is a dry temperate climate. Cooling summer breezes come from the South. With blustery cold winds in winter. The home faces due West. And the living areas in the home are on the north side. The family used to live in another house in Sunbury so they could compare their energy consumption from each household. In comparison, energy consumption of the green home reduced household energy bills to one-third. Also the water consumption in the house reduced to one half of the Melbourne average for a family of this size. The zoning of the green home help maximizes winter warmth and reduce summer heat. The green home design allows for flexibility of use. Internal rooms open up and allow for an increase in the house volume during summer. During winter, closing down these same rooms reduce the house volume. Reducing the amount of heat required. Sometimes the winter sun is sufficient to warm the room. The flexibility of use of the spaces allows the ability to open up or close down the glass wall of the solar court to the main house. Rooms remain warm with the natural winter sun. Ceiling fans move warmed air downwards when needed in winter. High ceilings with high windows help release hot exhaust air in summer. The house eaves and solar pergola shade the north side of the house. West facing windows take in the long distance vistas of the surrounding Sunbury hills. 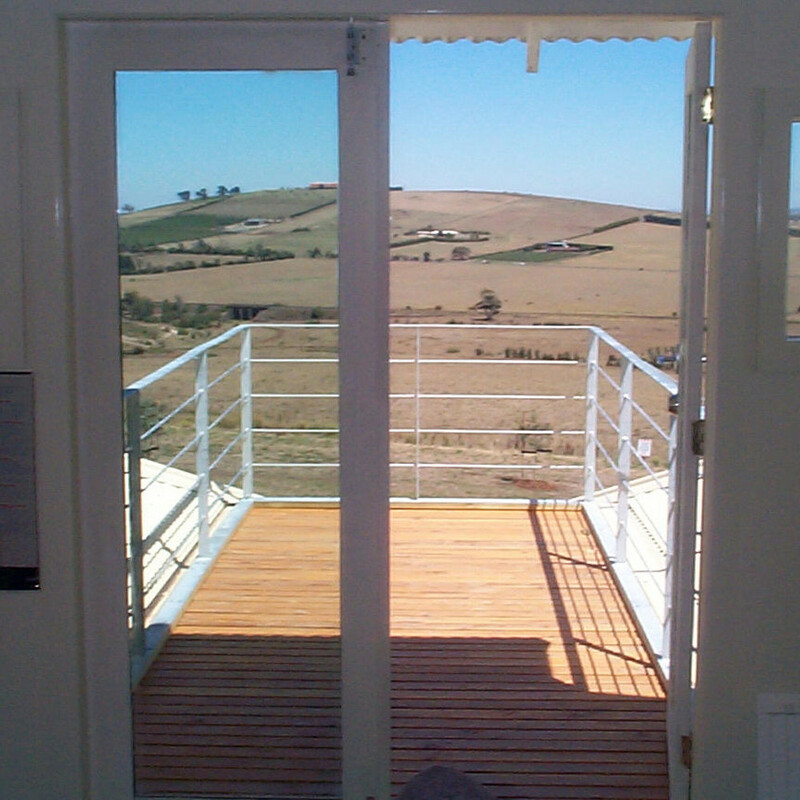 Solar window film on these windows allow the views without heat gain from the setting summer sun. The garage and garden court shade the house from the early morning summer sun. Placed on the northeast side of the green home they shade the kitchen and living areas. The green home uses high efficient double glazed windows. There are also high levels of the ceiling and wall insulation. The internal arrangement of the home allowed for an unobstructed flow of air. Window placement helps facilitate cross ventilation. Nearby the Sunbury green home is the former Sunbury Asylum. Opened in 1879, the design of the Asylum is in the Victorian architectural style. Many individual buildings make up the Asylum complex that features an eclectic mix of building elements. A brief history of the Asylum had seen the use of these heritage buildings change over the years. Until 2008, Victoria University Campus was in residence at the Asylum site. Since then it has opened for ghost tours. The heritage buildings on Sunbury hill provide an architectural reference for the green home features. The reference to the heritage buildings is evident in the roof forms at the front of the home. Besides the aesthetic, these roof forms help to exhaust of hot air from the roof spaces as they provide the ventilated shafts of the solar chimneys. Passive solar house design principles help establish the rectilinear form of the building. The main roof form houses a mezzanine. Used as an office, this maximizes the space of the home. The mezzanine office opens to the roof terrace that sits between the front roofs. The stone clad plinth of the house protects the weathering of the external walls. Two of the children in the family had asthma. The green home low allergy design reduced allergies in the house. Resulting in asthma subsiding in both children. so why is the Sunbury eco green home a profitable, sustainable home? Once the children reached high school age, the family decided they needed to move. They needed to be in the school zone for their children’s preferred high schools. Consequently, the family moved and took with them many fond memories of the green home. The sale of the Sunbury green home fetched twice as much as the cost of construction which made it a very profitable and sustainable eco home. 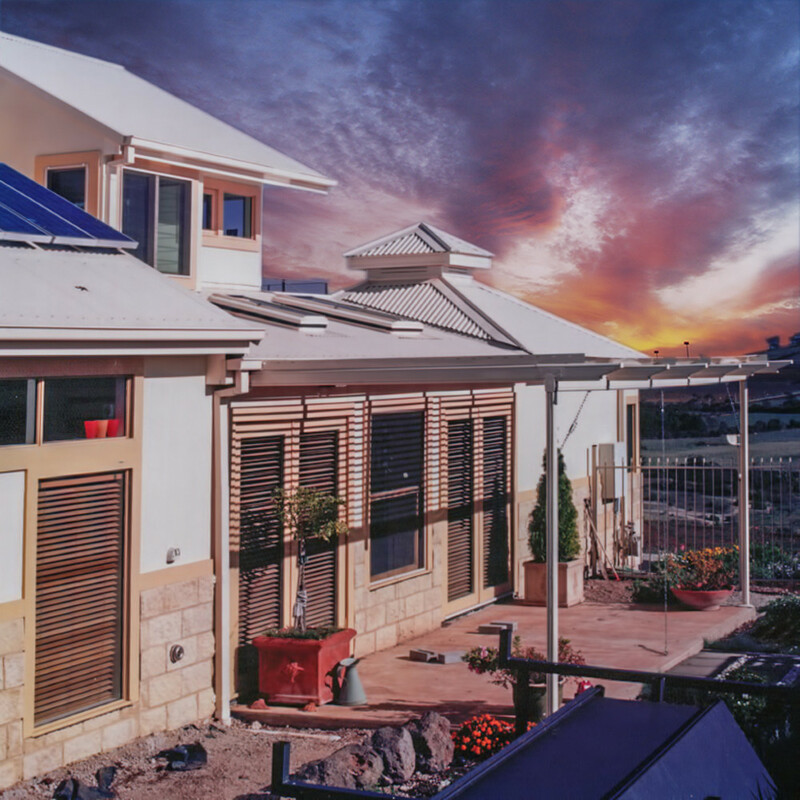 The eco-home in Sunbury is one of ten Australian sustainable homes featured in the Australian Government’s ‘Your Home DVD’. The DVD is an interactive step-by-step guide to comfortable stylish and healthy living. It is also a case study on the Australian Government’s ‘YourHome’ CD. 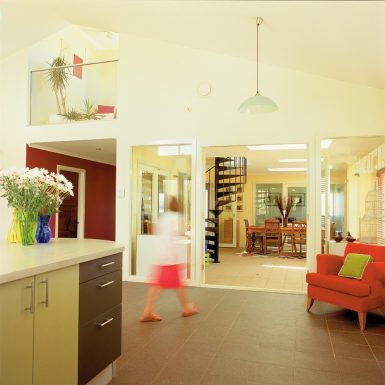 Also, the Sunbury eco home is a case study in the Australian Government’s technical reference ‘YourHome’. Sunbury eco home Awarded the MBA Master Builders Association National Environment and Energy Building Efficiency Award. For Housing under $300,000. 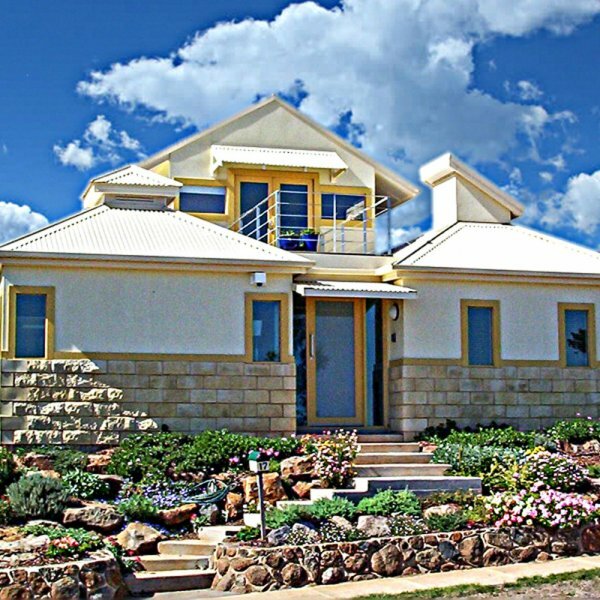 Sunbury eco Home awarded The Silver Medal. 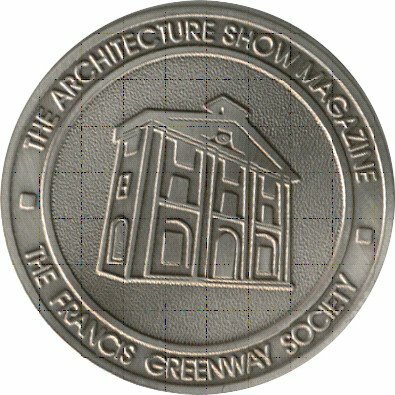 In the Architecture Show Magazine and the Francis Greenway Society Green Buildings Awards.